The incidence rate of AKI is increasing across the spectrum of hospitalized children and adults. Given the increased morbidity and mortality associated with AKI, significant research effort has been appropriately focused on standardizing AKI definitions, identifying risk factors, and discovering and validating novel, earlier structural biomarkers of kidney injury. In addition, a growing body of evidence demonstrates that AKI is a risk factor for the future development or accelerated progression of CKD. Unfortunately, prospective observational studies have not consistently followed survivors of episodes of AKI for longitudinal outcomes after hospital discharge, which could lead to ascertainment bias in terms of over- or underestimation of CKD development. Furthermore, data show that clinical follow-up of AKI survivors is low. This lack of systematic study and clinical follow-up represents a potential missed opportunity to prevent chronic disease after an acute illness and improve outcomes. Therefore, prospective study of transitions of care after episodes of AKI is needed to identify which patients are at risk for CKD development and to optimally target therapeutic interventions. The incidence rate of AKI has increased over the past decades in hospitalized adults and children (1,2). The development of standardized, multidimensional classification criteria for AKI, such as the RIFLE (Risk, Injury, Failure, Loss, and ESRD), Acute Kidney Injury Network, and pediatric RIFLE criteria, provides the means for consistent epidemiologic assessment of AKI incidence and severity (3–6). The application of these criteria in numerous hospital-based cohort studies has helped identify patients at high risk for development of AKI and demonstrated an indisputably strong association between development and severity of AKI and mortality (7,8). More precise AKI risk stratification, using a combination of demographic characteristics and clinical signs, also known as “renal angina,” has recently been proposed to guide more optimal AKI biomarker assessment and drive the design of prevention trials in AKI (9). The focus on AKI prevention and mitigation is understandable because researchers hypothesize that prevention of AKI will lead to improved outcomes and decreased mortality. Unfortunately, prevention trials of AKI are especially difficult to conduct (10); improving outcomes in AKI will require attention to other important areas of AKI care. In particular, survivors of episodes of AKI who are at risk for the development or worsening of CKD need greater attention. The burden of CKD on the global health care system is well documented, so the importance of preventing or minimizing CKD progression in survivors of AKI episodes cannot be overstated. To this end, the recent Kidney Disease Improving Global Outcomes (KDIGO) clinical practice guideline proposed a new conceptual model, called acute kidney disease, to highlight the need to follow survivors of AKI episodes in the near term and monitor development of signs and symptoms of CKD, with a focus on screening for markers of kidney damage (i.e., proteinuria) and/or reduced GFR (6). Implementation of electronic health records enhances the opportunity to systematically identify patients with AKI (11,12). As a result, survivors of AKI episodes can become readily identifiable for longitudinal follow-up, especially in integrated health care delivery systems. Yet, as we will demonstrate in this review, published follow-up studies of survivors of AKI episodes reveal high attrition rates. We view this lack of systematic follow-up as a missed opportunity to identify and test strategies to prevent chronic disease after an acute illness. AKI complicates up to 20% of hospital admissions and currently has an estimated population incidence of 2147 per million people. The incidence of AKI is increasing, however, and is expected to double over the next decade (13,14). AKI is associated with numerous in-hospital and long-term complications, including an independent increased risk of death (15,16). Although the increased mortality from AKI is well documented, the effect of an episode of AKI on other outcomes has only recently been brought into focus, particularly with regard to the increased risk of CKD (17,18). There are three patterns by which patients with AKI who have normal baseline kidney function might progress to CKD (19). For some, the initial episode results in permanent kidney failure, and the patient remains dialysis dependent (AKI to ESRD). For others, the initial episode of AKI results in incomplete recovery of AKI compared with the baseline kidney function, resulting in CKD (AKI to CKD). In a third pattern, the kidney function initially returns close to baseline after an episode of AKI, and later the patient progresses to CKD (AKI to “subclinical CKD”). Although some patients may completely recover kidney function after an AKI episode, such patients may also be at increased risk of CKD (20). Thirty percent of patients with AKI have preexisting CKD (21,22); thus, three similar patterns of outcome after AKI may apply to patients with preexisting CKD: (1) AKI to ESRD, (2) AKI to worsening CKD, and (3) AKI to initial recovery followed by worsening CKD. AKI to CKD is also an important issue in kidney transplant recipients; notably, a recent report demonstrated that 11% of kidney transplant recipients developed AKI within the first 3 years of transplantation, which, in turn, was associated with an increased subsequent risk of CKD and graft loss (23). The effect of these patterns of CKD after AKI regarding CKD development, progression to ESRD, and long-term mortality is substantial. Acute tubular necrosis is cited as the cause of ESRD for nearly 3% of patients with incident ESRD according to the U.S. Renal Data System annual report (24). In cohorts of patients with preexisting CKD, up to 15% of patients with an episode of AKI remain dialysis dependent after hospital discharge (25). Although the clinical distinction between AKI to CKD and AKI to “subclinical CKD” has not been clearly defined, these patterns of CKD progression after episodes of AKI probably represent the larger public health concern because they affect more of the population. Observational studies report that 20%–50% of survivors of AKI episodes progress to CKD (26,27). If the aforementioned estimated AKI population incidence (of 2147 per million people) is applied to the population of the developed world (about 1 billion living in the United States, Canada, Europe, and Australia/New Zealand), we would estimate more than 2 million cases of AKI annually (Figure 1). Of these, 10%–15% will die in the course of the associated acute illness, 3%–15% will develop permanent kidney failure (i.e., ESRD), and 20%–50% will progress to CKD. Even if the most conservative values are taken for each of these estimates, AKI will be associated in the developed world with death, ESRD, or CKD for approximately 600,000 patients annually. Estimates of AKI burden in developed countries and outcomes of survivors. Assumptions are based on an estimated population of about 1 billion in developed countries, which represent the United States, Canada, Europe, and Australia/New Zealand, and an AKI incidence of 2147 cases per million people. ESKD, end-stage kidney disease. Major risk factors for CKD progression after AKI include advanced age, diabetes mellitus, hypertension, heart failure, increased Charlson comorbidity score during AKI episode, preexisting CKD (as defined by proteinuria or reduced GFR), and low levels of serum albumin, a dual marker of nutrition and inflammation (17,18,20,28) (Table 1). The presence of these risk factors should alert practitioners to be especially vigilant for CKD development after an episode of AKI. In addition, severity and frequency of AKI episodes have been shown to be independently associated with CKD progression (28–30). The findings linking both severity and frequency of AKI episodes to CKD progression support the premise that CKD progression after AKI is not just an epiphenomenon but is intrinsically linked to episodes of kidney injury; recent studies show that biomarkers of inflammation and tubular injury, at the time of clinical AKI, may play a role in predicting the degree of renal recovery after an episode of severe AKI (RIFLE F). Ongoing inflammation also appears to be a risk factor for CKD progression (31). These clinical findings are supported by preclinical data that mirror those risk factors identified in large observational studies (17,32–34). The pathophysiology of CKD progression after AKI is a rapidly evolving field of investigation. Preclinical studies suggest that there may be a threshold for the development and progression of CKD compared with normal kidney repair and regeneration (32). The main mechanisms incriminated in CKD progression include inappropriate vascular, interstitial, and tubular regeneration after AKI (17). These maladaptive processes appear to be linked to impaired angiogenesis and reduced endothelial proliferation (35,36), cell cycle arrest (37), persistent fibrosis (38), epigenetic changes (33), increased expression in kidney tissue microRNAs associated with renal fibrosis (39), and ongoing inflammation (34). Further research to identify potential therapeutic targets to mitigate CKD progression after AKI in humans is urgently needed. Children provide an informative group for the study of AKI leading to CKD development and/or progression because they do not possess many of the comorbid conditions seen in adults. Furthermore, many of the first biomarker validation studies in AKI were performed in children, including cohorts of cardiac surgery, multiorgan failure, and primary kidney disease (e.g., hemolytic uremic syndrome) (40–42). The negative health outcomes of CKD are well established, and the association between childhood CKD (even at early stages) and cardiovascular disease (CVD) is evident. Children with CKD have subclinical atherosclerosis and multivessel calcification (43,44), endothelial dysfunction, hypertension, left ventricle hypertrophy, and increased risk of cardiovascular events, such as myocardial infarction (43–47). Microalbuminuria is an established risk factor for CVD-related morbidity and mortality (48,49). Because the pathogenesis of CVD begins early in children with CKD, prompt identification of risk factors for CKD and early CKD detection are paramount. AKI may be a significant risk factor for early childhood CKD development, incurring higher risk for negative health outcomes, including CVD. Recent reviews detail the high rates of CKD, hypertension, and microalbuminuria in children who survive an AKI episode (50 ) and reveal a very low rate of long-term follow-up. Children who develop AKI do, in fact, display long-term findings of CKD, as evidenced by the development of hypertension, microalbuminuria, and reduced GFR (Table 2) (37,51–56). The post-AKI rates of hypertension, microalbuminuria, and low GFR are remarkable, given the low prevalence of these kidney-related outcomes in the general pediatric population. Review of Table 2 demonstrates that children with cancer-associated AKI have routine kidney function assessment (100% follow-up rate) as part of national clinical research networks, yet long-term follow-up rates for children with non–cancer-associated AKI episodes range from 32% to 71%. Because these rates were ascertained in the context of clinical studies of patients who developed AKI, the actual risk of transitioning from AKI to CKD remains unknown. These studies are also limited by the small sample size, lack of control populations, and, for the most part, lack of gold standard GFR measurements. The data presented in this review demonstrate that AKI is clearly associated with CKD development. Whether AKI is an independent causal factor for CKD development or simply represents an association with CKD by virtue of shared risk factors has been the subject of recent editorial commentaries (57,58 ) and is beyond the aim of our review. We argue neither for nor against a unidirectional causal AKI-to-CKD relationship at this point but rather suggest that proof of causality is not necessary at this point because AKI may be a “canary in the coal mine” to uncover unrecognized CKD. Although no conclusive data exist to demonstrate whether less severe AKI leads to CKD, we are reminded that before the development of the RIFLE or Acute Kidney Injury Network classification systems, few would have thought that “mild” degrees of AKI, such as a 50% or 0.3-mg/dl increase in serum creatinine, would be independently associated with death. Indeed, in a recent study demonstrating that an episode of AKI nearly doubled the risk of CKD development, 70.6% of the AKI cohort had AKI stage I, suggesting that even “mild” AKI is a risk factor for subsequent CKD (20). Thus, it may be prudent to withhold judgment on which patients to exclude for follow-up of AKI to CKD. Until we can reliably predict which AKI survivors will develop CKD, we urge that adults and children who survive episodes of AKI be followed regularly to assess for early evidence of CKD (i.e., development of hypertension, proteinuria, or reduced GFR), to allow for low-technology, low-cost, well established interventions to slow progression of diagnosed CKD to ESRD. Currently, only approximately one third of patients with dialysis-requiring AKI (the equivalent of KDIGO AKI stage III) are seen by a nephrologist within 30 days of hospital discharge. This rate increases to 48.6% within 1 year of hospital discharge, which is probably the result of reduced GFR (59). 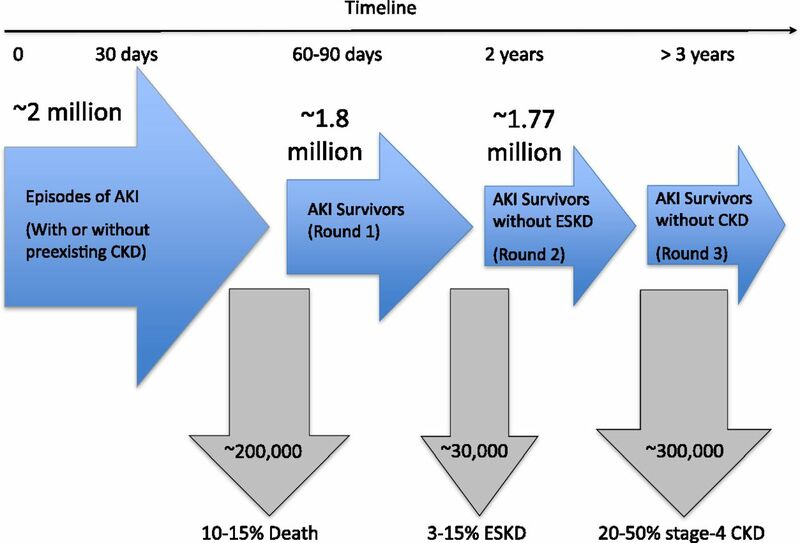 Because AKI survivors have not been followed systematically, we cannot provide evidence-based guidance on which AKI survivors or what AKI severity stage should prompt follow-up. A reasonable approach may be to follow all patients who received renal replacement therapy or who developed KDIGO AKI stage II or III. However, because recent adult and pediatric studies reveal that fluid overload can mask AKI by dilution of serum creatinine (60,61), we cannot confidently state that patients with AKI stage I should not be followed. Simple interventions, such as the avoidance of nephrotoxins (e.g., nonsteroidal antiinflammatory drugs), use of blockers of the renin-angiotensin-aldosterone system, and BP control may prove to be critical interventions to mitigate CKD progression in these at-risk patients (62). At this time, however, we cannot be sure that such measures will be effective in mitigating the potential progression of AKI-associated CKD; such information can be developed only through systematic follow-up and prospective study. To ensure better recognition and follow-up, we recommend that an “episode of AKI” be documented in the medical history portion of the electronic health record; furthermore, a past episode of AKI should be ascertained as part of the routine evaluation of all patients with CKD. Hospital discharge risk scores can also be deployed to identify patients in whom CKD progression is more likely (28). As noted at the beginning of this review, AKI survivors provide a potentially captive longitudinal patient population for the study of CKD development and progression. Although some evidence suggests that AKI severity, including acute temporary dialysis requirement, and repeated episodes of AKI may portend an increased risk of CKD in adults and children, these hypotheses need to be examined systematically. Currently, the Translational Research Investigating Biomarker Endpoints for AKI Study consortium (TRIBE-AKI, www.yale.edu/tribeaki) and the Assessment, Serial Evaluation, and Subsequent Sequelae in AKI (ASSESS-AKI) consortium will examine long-term kidney outcomes in several cohorts, including children who have survived cardiopulmonary bypass–associated AKI from at least three pediatric centers (63). As we await the results of these important studies, we propose that pilot and feasibility studies should be conducted to help mitigate the development and progression of CKD after episodes of AKI. The authors would also like to acknowledge Rachel Shaffer of the ASN for the organizational and logistical support for the AKI advisory group. All the authors are members of the Acute Kidney Injury Advisory Group of the American Society of Nephrology (ASN). The opinions expressed in this manuscript are the opinions of the authors and not necessarily the opinions of their institutions or all the members of the ASN. Acute Kidney Injury Advisory Group to the ASN 2012 Members: Jorge Cerda (Albany Medical College, Albany, NY), Lakhmir S. Chawla (George Washington University, Washington, DC), Sarah Faubel (University of Colorado and Denver Veterans Affairs Medical Center, Denver, CO), Dinna N. Cruz (University of California, San Diego, CA), Zheng Dong (Medical College of Georgia, Augusta, GA), Stuart L. Goldstein (Cincinnati Children’s Hospital Medical Center, Cincinnati, OH), Benjamin D. Humphreys (Harvard Medical School, Boston, MA), Jay L. Koyner (University of Chicago, Chicago, IL), Bertrand L. Jaber (Tufts University School of Medicine, Boston, MA), Kathleen D. Liu (University of California, San Francisco, CA), Thomas D. Nolin (University of Pittsburgh, Pittsburgh, PA), Krishna R. Polu (Affymax, Palo Alto, CA), Didier Portilla (University of Arkansas College of Medicine, Little Rock, AR), Krystyna E. Rys-Sikora (National Institutes of Health, Bethesda, MD), Mark D. Okusa (University of Virginia School of Medicine, Charlottesville, VA), Rachel N. Shaffer (American Society of Nephrology, Washington, DC). Making the Right Decision: Do Clinical Decision Support Systems for AKI Improve Patient Outcomes?